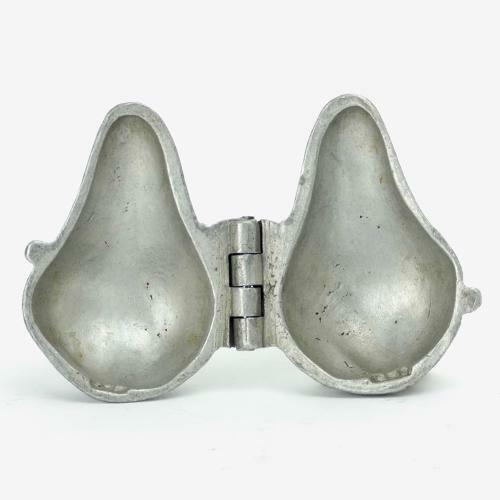 A small pewter ice cream mould in the shape of a pear. This is marked, in the casting, 'L G' above the number '921'. LG is the mark of the French company Letang and 921 is the pattern number. It dates from c.1870. The mould is very simple in form and it would turn out the full form of a pear. The hinge is slightly wobbly as the piece has seen much use, but other than that it is in very good condition. The interior is in bright, clean, usable condition and the exterior has quite a light patina.